Boogarins’ debut album, As Plantas Que Curam, was a home recording created in the houses of Fernando “Dino” Almeida and Benke Ferraz’s parents in Goiânia, Brazil. 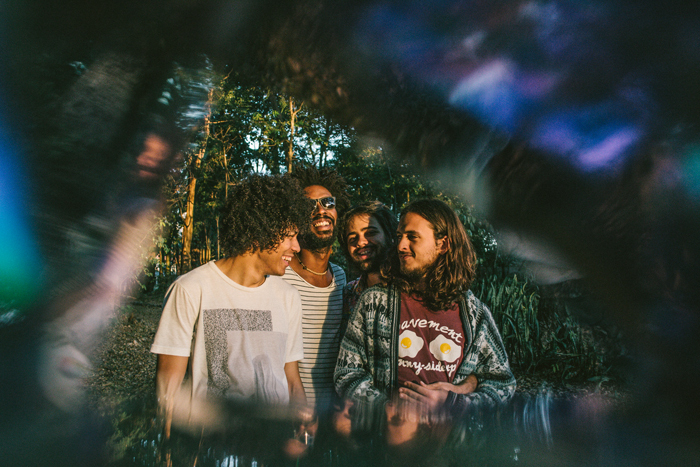 It gained the young band fame around São Paulo and, through constant touring and festival performances, Boogarins gained a following as a favorite in the re-emerging psychedelic rock scene. Manual, Boogarins’ sophomore LP, was an album born and bred on the road. In the middle of their 2014 touring, Boogarins took a two-week hiatus to record some music to tape, which would become the meat of the record. As they finished up touring in South America, they worked on and added to these rough drafts and did some production work in studios in Spain and back home in Brazil to bring it to life. Though this album contains the similar psychedelic pop and occasional tropicalia adn elements as their debut, There is more emphasis on the competing guitars that are more rhythmic than droney. The New York Times’ Press Play currently has the album available for streaming, as does the Other Music SoundCloud. The full title of the album is Manual, ou guir livre de dissolução dos sonhos – Manual, or Free Guide to the Dissolution of Dreams. This seems to hint that this album is a manual or a journal, perhaps something that must be labored by hand (manual). The opening song, “Avalanche” is about the relationship between dreaming and working, and of having a voice in the face of inequality, corruption and oppression.